Emily Musgrove's brother Lambert William Harris had moved to Clerkenwell and was employed as a french polisher. 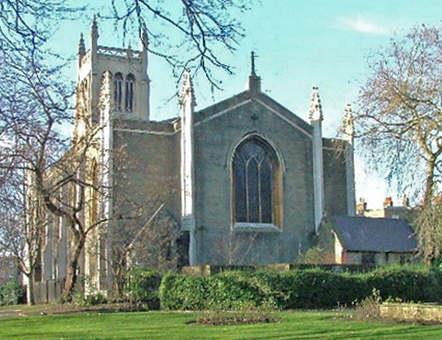 On August 2nd he married Alice Eliza Bristow at St Mark's church Myddleton Square. Witnesses to the wedding were George Musgrove and the Brides sister Ellen Maria Bristow. The above certificate shows both Lambert and Alice were living at the same address, 283 Goswell Road Clerkenwell. 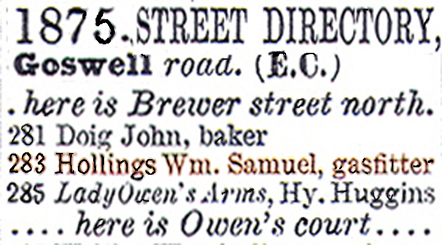 This is listed in the 1875 Street Directory below as the residence of William Samuel Hollings, gas fitter. He was the uncle of Alice Bristow, being the brother of her mother Mary Ann Hollings. 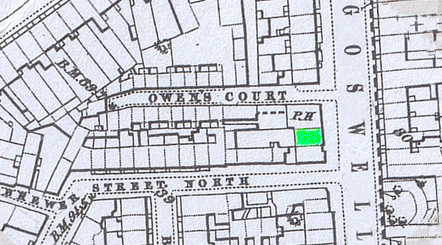 The map below shows the position of Holling's shop in Goswell Road. It was located between the junctions of Owen's Court and Brewer Street North and was next door to the Lady Owen's Arms Public House. This area has been totally redeveloped recently with no trace remaining of these properties.